The Appalachian LCC funds research of the conservation community’s top science needs to address the landscape conservation challenges within the region. 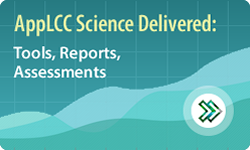 By identifying, prioritizing, and supporting fundamental scientific research through coordination and strategic investment of scarce resources, the Appalachian LCC is fostering the development and application of vital information and decision-support tools. Find here a list of the Appalachian LCC funded research as well as that of their partners and additional organizations within the region. Given the rapid environmental change experienced and expected across the Appalachians, it will be crucial to understand the vulnerabilities of valued ecosystem services to drivers of large-scale change that may threaten their sustainability. The Appalachian LCC has partnered with the US Forest Service Eastern Forest Environmental Threat Assessment Center to assess ecosystem services, and vulnerabilities to environmental risk factors, throughout the Appalachians. Synthesizing current knowledge of the diverse benefits that people derive from functioning Appalachian ecosystems will help managers, scientists, industries, and the public to establish a common language for linking the environmental and economic values of the region’s natural assets in a way that encourages protection of and investments in these resources. It has been recognized by the Appalachian LCC partnership that to develop and deliver landscape-level planning tools, it is essential to develop an Appalachian-wide map depicting where cave and karst habitats and resources occur across the landscape. For the past 18 months, researchers for the Appalachian LCC funded “Classification and Georeferencing Cave/Karst Resources across the Appalachian LCC” project have been gathering and analyzing data on caves and karst region wide. This work has produced a series of deliverables, including narratives, data tables, geospatial information layers, and a variety of maps. The maps and files provide a comprehensive overview of data availability for examining relationships between environmental factors and biological diversity and distribution within karst areas of the Appalachian LCC. The Data Needs Assessment research project was undertaken to review the variety of resources on conservation planning to provide packages of products, data, and identified data gaps to improve conservation planning in the Appalachian LCC. A suite of core conservation planning products and data from principal investigators at Clemson University are now available to the Cooperative. Unifying state-based stream classifications into a single consistent system, principal investigators at The Nature Conservancy developed a hierarchical classification system and map for stream and river systems for the Appalachian LCC that represents the region’s natural flowing-water aquatic habitats. This river classification information is needed to develop and implement instream flow standards and management recommendations so that environmental flows can become integral to all water management decisions from the onset. The southeastern U.S. contains a unique diversity of ecosystems that provide important benefits, including habitat for wildlife and plants, water quality, and recreation opportunities. As climate changes, a better understanding of how our ecosystems will be affected is vital for identifying strategies to protect these ecosystems. While information on climate change affects exists for some ecosystems and some places, a synthesis of this information for key ecosystems across the entire Southeast will enable regional decision-makers, including the LCCs, to prioritize current efforts and plan future research and monitoring. Expansion of drilling sites and associated infrastructure to extract natural gas from the Marcellus shale deposits has the potential to significantly reduce existing forest cover across the Marcellus field and leave what remains in a fragmented state. Assessing Future Energy Development across the Appalachian LCC used models that combined data on energy development trends and identified where these may intersect with important natural resource and ecosystem services to give a more comprehensive picture of what potential energy development could look like in the Appalachians. Ultimately this information is intended to support dialogue and conservation on how to effectively avoid, minimize, and offset impacts from energy development to important natural areas and the valuable services they provide. A significant challenge faced by climate scientists in the public and private sector is the need for information about the historical status of ecological systems expected to be influenced by climate change. The need is especially acute for reliable and complete information about monitoring networks maintained by government and non-governmental organizations and associated data. While many organizations monitor one or more aspects of aquatic and terrestrial ecosystems, these monitoring programs are seldom coordinated and information about both the networks and the associated data are not readily available. The DOI Southeast Climate Science Center is participating in an effort by multiple federal, state, and other organizations to develop a comprehensive and integrated assessment of monitoring networks associated with atmospheric, stream, and terrestrial ecosystems. The objective of this two-year project is to support the development of this assessment. Few previous studies have focused on how climate change may impact headwater systems, despite the importance of these areas for aquatic refugia. The lack of these studies has resulted in the majority of climate impact assessments focusing on conservation of ecological systems at broad levels, and has not focused on turning results into useful and actionable information for managers on the ground. A critical and timely research question is: “What data and modeling frameworks are needed to provide scientists reliable, climate-informed, water temperature estimates for freshwater ecosystems that can assist watershed management decision making?” This research will answer this through two primary activities: 1) gathering and compiling existing stream temperature data within the DOI-Northeast region and subsequent deployment of data loggers to areas where additional data are needed, and 2) an intercomparison of state-of-the-art statistical and deterministic stream temperature models to evaluate their ability to replicate point stream temperature measurements and model scalability to non-gaged sites with the Northeast region. Predicting population responses to climate change requires an understanding of how population dynamics vary over space and time. For instance, a measured indicator may vary among repeated samples from a single site, from site to site within a lake, from lake to lake, and over time. Although variability has historically been viewed as an impediment to understanding population responses to ecological changes, the structure of variation can also be an important part of the response. In this project, we will build upon recently completed analyses of fish population data in the Great Lakes basin to help predict how spatial and temporal variation in fish populations may respond to climate change and other important drivers. A DOI Southeast Climate Science Center funded research project will be evaluating the latest generation of global climate models to generate scenarios of future change to climate, hydrology, and vegetation for the Southeastern U.S. as well as the entire range of the Appalachian LCC. Conservation practitioners must navigate many challenges to advance effective natural-resource management in the presence of multiple uncertainties. Numerous climatic and ecological changes remain on the horizon, and their eventual consequences are not completely understood. Even so, their influences are expected to impact important resources and the people that depend on them across local, regional, and sometimes global scales. Although forecasts of future conditions are almost always imperfect, decision makers are increasingly expected to communicate and use uncertain information when making policy choices that affect multiple user groups. The degree to which management objectives are met can depend on 1) how critical uncertainties are identified and accounted for, and 2) effective communication among user groups, scientists, and resource managers. Climate change is already affecting biodiversity, changing the dates when birds arrive to breed and when flowers bloom in spring, and shifting the ranges of species as they move to cooler places. One problem for wildlife as their ranges shift is that their path is often impeded – their habitats have become fragmented by agriculture and urbanization, presenting barriers to their migration. Because of this, the most common recommended strategy to protect wildlife as climate changes is to connect their habitats, providing them safe passage. There are great challenges to implementing this strategy in the southeastern U.S., however, because most intervening lands between habitat patches are held in private ownership. We will combine data on key wildlife species and their habitats throughout the southeastern U.S. with new computer modeling technologies that allow us to identify key connections that will be robust to regional and global changes in climate and land use. This project coordinates with partners to provide a systematic comparison of existing habitat classification and mapping products within the footprint of the Northeast Climate Science Center (NECSC), a merged and improved map product as far as possible, an evaluation of habitats vulnerable to climate change within the region, and recommendations for needed improvement in habitat mapping products for the future. Traditional urban growth models are very localized and data-intensive and lack the capability to be applied across large regions, in response to these limitations the North Carolina Cooperative Research Unit began using the USGS SLEUTH urban growth model to develop urbanization scenarios as part of the Southeast Regional Assessment Project (SERAP). Extensive modifications of the model framework and calibration were undertaken that resulted in the ability to rapidly develop urbanization scenarios for very large regions, such as the Appalachian and Gulf Coastal Plain Landscape Conservation Cooperatives (LCCs). This new modeling effort allows LCC’s to address fundamental questions that affect conservation planning over decadal time scales. The Appalachian LCC collaborated with Cornell University to study the environmental impacts of water withdrawals in the Central Appalachian region. The rivers and streams of the Central Appalachians are home to more than 200 species of fish and other aquatic life. They also provide a reliable source of drinking water, recreational opportunities and associated economic benefits to people living in large cities and surrounding communities. This research looks at how the region’s surface freshwater supply – and the health of natural systems delivering this resource – have been impacted and may be altered in the coming years under increasing water withdrawals. It focuses on the Marcellus Shale region in the Central Appalachians, including portions of NY, PA, OH, MD, WV and VA. Stream flows are essential for maintaining healthy aquatic ecosystems and for supporting human water supply needs. Integrated modeling approaches assessing the impact of changes in climate, land use, and water withdrawals on stream flows and the subsequent impact of changes in flow regime on aquatic biota at multiple spatial scales are necessary to insure an adequate supply of water for humans and healthy river ecosystems. The combined application of simple, large scale models with more complex, high resolution models has the potential to provide for more robust climate change impact studies, which focus on maintaining a better balance between the availability of water to support aquatic assemblages while conserving water for long-term human needs than using either approach in isolation. The Appalachian LCC is currently engaged in an effort to develop a draft regional conservation plan for the Cooperative using an interactive and iterative spatial prioritization framework. Using available data and modeling approaches that are well supported in the literature, researchers from Clemson University are developing conservation planning models that include site selection, ecological threat assessments, and broad ranging habitat and ecological connectivity analyses. Glades and glade-woodland complexes are natural communities which provide high-quality habitat for several priority bird species including the Prairie Warbler, Blue-winged Warbler, Field Sparrow, Northern Bobwhite, Eastern Wood-Pewee. We also recognize the importance of glade complexes to other flora and fauna species of conservation concern. Provision of shade via riparian restoration is a well-established management adaptation strategy to mitigate against temperature increases in streams. Effective use of this strategy depends upon accurately identifying vulnerable, unforested riparian areas in priority coldwater stream habitats. An innovative riparian planting and restoration decision support tool is now available to the conservation community. This user-friendly tool allows managers and decision-makers to rapidly identify and prioritize areas along the banks of rivers, streams, and lakes for restoration, making these ecosystems more resilient to disturbance and future changes in climate. Future climate change adaptation and mitigation strategies will be dependent on the best available projections of how the regional climate will change and the impacts those changes will have on the region’s natural and cultural resources. Understanding the vulnerability of various species and habitats to climate change within the Appalachian LCC is of critical importance for making effective conservation decisions. The AppLCC funded a Climate Change Vulnerability Assessment research project that addresses several factors: 1) how the Cooperative should acquire information about the climate vulnerability of Appalachian species and habitats to develop vulnerability assessments for a suite of key species and habitats to share with partners; 2) compilation of known vulnerability assessments of species and habitats, and 3) new climate change vulnerability assessments of selected species and habitats in the AppLCC region. Downscaling translates large-scale climate information to the local scale. There are several techniques for handling this process; recently, several downscaled climate products have been produced by government and academic researchers. Ecologists, conservation scientists, and practitioners require such local guidance to evaluate adaptation and conservation strategies. However, the large number of methods involved, different downscaling approaches, resolutions, time periods, and focal variables limits the ability of these users to form meaningful conclusions and evaluate the results of adaptation strategies. To address these issues, this project will summarize the methods used for downscaling, identify the metrics most appropriate for evaluation of climate model skill and usability for the ecological and conservation communities in the southeastern US, and begin a longer-term effort to evaluate the range of downscaled climate products over this geographic region.